Krissy Hancock has moved to Pine Hills with her best friend to open a coffee and book shop, Death by Coffee. When business doesn’t pick up right away, Krissy is concerned that it could be due to the death of a man who works in the building across the street – a man who had come in for a cup of coffee just minutes before his death. Determined to find the killer in order to squelch rumors that Death by Coffee may actually be serving tainted coffee, Krissy conducts her own investigation. This was a well plotted and well written mystery, but I did have trouble believing people would tell Krissy as much as they did, with her confrontational way of interrogating her suspects. 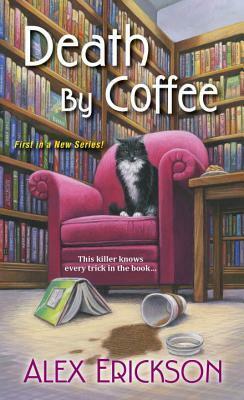 The story was entertaining though, and cozy mystery fans should enjoy it. I’ll be watching for the next installment, Death by Tea, to come out this December! I’m gonna die by drinking too much coffee.